The range of the factory Ulysses gas tank is a mere 180 miles (give or take), and for my solo touring I simply require more mileage than that. 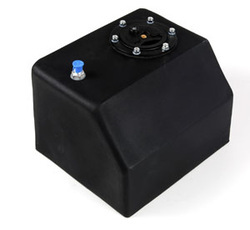 I looked at several options, and ended up with this Jegs 4 gallon drag racing fuel cell. It has a vent port on the top, and an outlet port on the bottom rear. I routed a fuel line beneath the subframe, from the drain plug beneath the factory gas tank, through a shutoff valve, a fuel filter, and up behind the seat. The tank can be removed and the remaining fuel line is not noticeable. 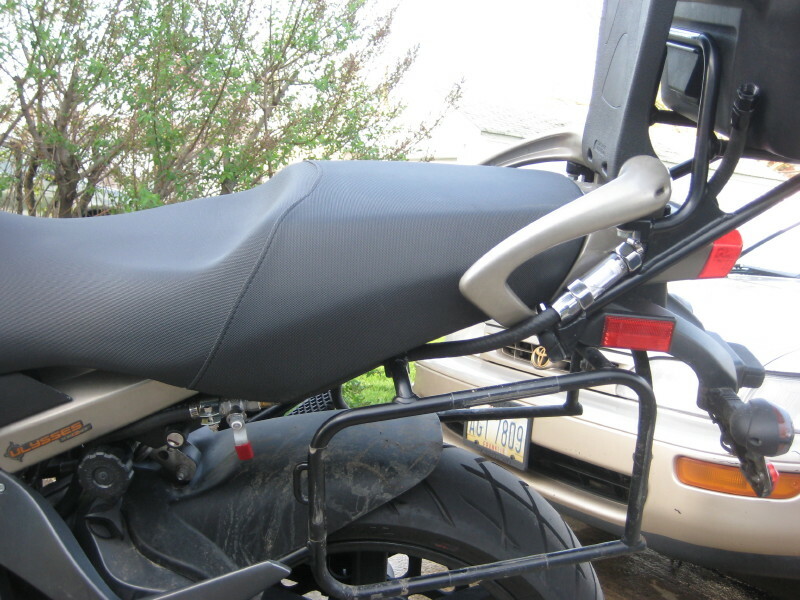 By mounting the tank on the passenger seat, handling is not effected and all the existing luggage remains in place. Due to the angle of the bike on the kickstand, I've never been able to fill more than three gallons of fuel into this tank, but that puts my range around 300 miles which is adequate. The first tank I purchased had an issue with the filler cap not seating properly and it leaked heavily. Thankfully, Jegs has a 1 year warranty, and they swapped it out no questions asked. The second tank appears to be holding up well. When touring, I fill both tanks, and ride till the low fuel light illuminates, at that point I have used about 3.3 gallons out of the main tank. I then open the valve allowing the 3 gallons from this fuel cell to refill the main tank. The low fuel light turns off, and I have another ~140 miles before the fuel light illuminates again. This shows the plumbing, with the tank not installed. It starts at the main tank drain plug, hidden to the bottom right. Goes up to a fuel shutoff tucked beneath the drivers seat, then back to a clear fuel filter beneath the passenger grab handle (so I can look back while riding and see if fuel is flowing). From there, the fuel line curves around the back of the grab handle, where it screws into the Aux. Tank sitting on the back seat, or, I tuck it beneath the top box if the fuel tank is not installed.